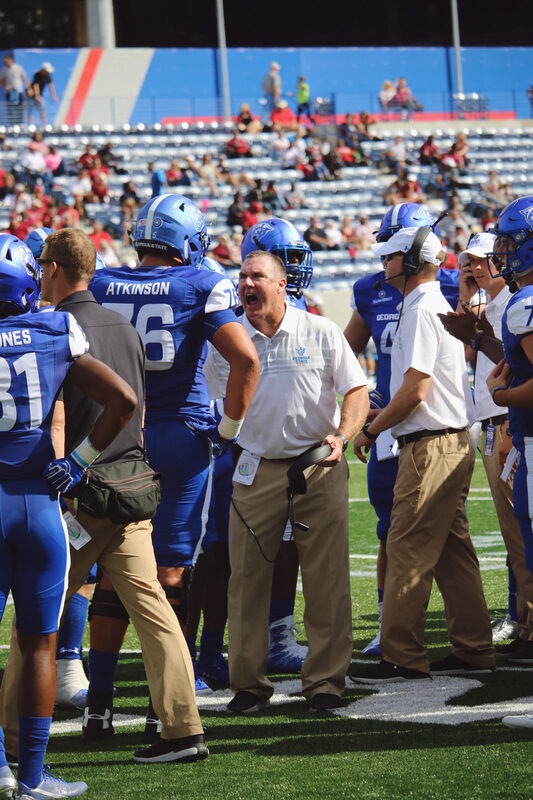 Football may not be in season at Georgia State, but for head coach Shawn Elliott and his staff, there is still much work to be done. Elliott recently completed his coaching staff by hiring Tim Bowens and Blake Gideon, who coach the running backs and cornerbacks respectively. Spring practices also start on March 7 and run until April 6, leading up to the annual Blue-White spring game. Bowens joins Georgia State after spending the past three seasons as the running backs coach at fellow Sun Belt school South Alabama. The hiring of Bowens gives way for Josh Stepp, who formerly coached both running backs and tight ends to move his sole focus to tight ends. Bowens attributed the decision to take the job within the conference to a few things, such as a really good conversation with Elliott at the Senior Bowl, the growth of Georgia State’s football program over the past year and an excellent location for his family. The backfield for Georgia State had its struggles in 2017 and dealt with a bevy of injuries throughout the year. Bowens will have his work cut out for him if he wants to make the backfield as efficient as the passing game. Bowens said he wants to work every day to develop them as people as well as players. He noted how important it is to know all of his guys as people first to help them connect with them on the field. Gideon comes to Georgia State after two impressive seasons at Western Carolina where he coached defensive backs. The defensive backs’ coach has a past working relationship with Elliott from their time together at South Carolina, and said it absolutely influenced his decision to come to Georgia State. He said that he’s already noticed the emphasis the coaches put on growing the players as young men first and called their skills and wins a byproduct of it. Gideon, a self-proclaimed preparation freak said that the main thing he hopes to bring to the program is preparedness. Like any good football mind, he said he’s always worried someone is out preparing him. The three coaches also talked spring practices: what they hope to learn from them and what players can expect during the month of spring practices. Elliott emphasized that these practices are not for conditioning, but for developing players and getting more efficient in offensive and defensive schemes. “Spring practices are used to learn players’ skill sets [to] develop an improvement plan to make them the best player they can be,” said Bowens. Gideon wants spring practices to be hard, saying, “I want to put the players in some really hard situations and test them physically and mentally.” He wants that level of intensity for a reason– to see where his corner room is and see what he’s working with. The additions of Bowens and Gideon to a program already poised to continue to grow should excite Georgia State fans. Fans can see all the work the coaches and players did in spring practices at the Blue-White spring game on April 7.